´Being Bahati´ Reality TV show has publicly aroused scandals in the singer´s nuclear family without stop. On the recently aired ´Being Bahati´ episode, Diana Marua pops up news that she will be travelling to Italy. This comes in without Bahati´s knowledge. Bahati finds this quite disrespectful, based on the fact that, it is dinner time and guests are present, then all of a sudden, Surprise! Immediately the quests leave, this is the artist´s reaction to his wife: Nielezee kama mimi ni bwanako ama kakako For one, if anything, we at least expect the couple to sort out their personal issues behind the cameras without having us get involved. Unfortunately, it seems marriage doesn´t have commandments or rules and regulations, so things happen, out of the blues. And this move by Diana Marua is nothing short of that. The audience should at least seem surprised, but not one of these two. Question is, how will the daughter be left without a mother, just because she wants to savor this trip abroad, to one of her relatives. What is ringing in Bahati´s mind is how a 1 year old will be left at home, while the mother is out on pastime? Something is not cooking right in the kitchen! 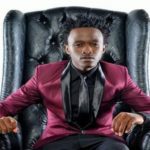 The post Gospel singer, Bahati publicly slams wife on popular ´Being Bahati´ show appeared first on Ghafla! Kenya.